Video wall screens are different to regular screens, they have thinner bezels (frames). These create a more seamless video wall image. The narrower the bezel the better. We use a number of manufacturers and suppliers to find the right video wall solution tailored to your requirements. For limited budgets, we are able to create video walls using standard screens, not usually used for such applications, creating an entry level opportunity without breaking the bank! 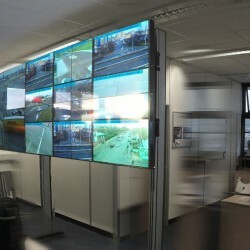 Most video wall screens are 46″, 47″ or 55″. To allow the screens to be mounted along side each other, the screens have a common bezel size, top and left bezel and a common bottom and right size bezel. 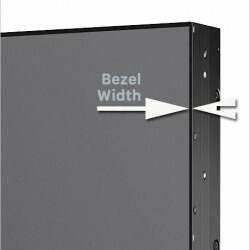 This gives an even size bezel when mounted together creating your video wall. The overall bezel size can vary from combined size of 5.5mm to 1.2mm, with an average combined bezel size of 3.5mm. Call us today for you FREE QUOTE 01252 560 911. 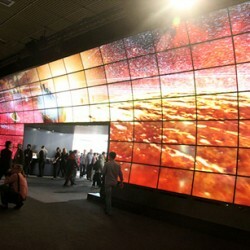 End of Line (fully supported) LG Video Wall Offer 47"
Tile screens to create your video wall. Long life, high reliability, specialised commercial video wall display. Tile screens to create your video wall. Long life, high reliability, specialised commercial display. Tile screens to create your video walls. Tile multiple screens to create your video wall, 2x2, 3x3 etc. Tile multiple screens to create your video wall, 2×2, 3×3 etc. Tile screens to create your video walls. Needs no separate controller to tile units. Super narrow bezel, total size of 3.5mm. Fitted with Samsung DID panel - long life, high reliability, specialised commercial display. Tile screens to create your video walls. Needs no separate controller to tile units. Super narrow bezel, total size of 3.5mm. Fitted with Samsung DID panel – long life, high reliability, specialised commercial display. Tile screens to create your video walls.Needs no separate controller to tile units.Super narrow bezel, total size of 5.7mm. Fitted with Samsung DID panel - long life, high reliability, specialised commercial display. Tile screens to create your video walls.Needs no separate controller to tile units.Super narrow bezel, total size of 5.7mm. Fitted with Samsung DID panel – long life, high reliability, specialised commercial display. Tile screens to create your video walls. Needs no separate controller to tile units Network function - play and transfer files through internet (requires additional hardware). Network function – play and transfer files through internet (requires additional hardware). The Digital Signage market is expanding rapidly. Every day we are seeing more digital screens appearing on the high street, in shopping centres, as information points, booking systems and in the corporate world. With the digital revolution securely in place the real solution is to go digital with your signage solutions. The possibilities are endless, and your content is king, so if you do it right it can work hard for you. And pay for it’s self.